was such big news, it made the cover of "Sports Illustrated". Every year, players from the CFL leave to pursue their dreams south of the border in the NFL. More money, lower taxes, and being closer to home are the usual reasons. As hard as it is to believe, there was a time, more than 30 years ago, when a high profile player jumped from the NFL to the CFL. However, in the end, the grass wasn’t greener for quarterback Vince Ferragamo. This whole saga began in 1981 when Sam Berger retired and sold the Montreal Alouettes to Nelson Skalbania. At the time Skalbania was best known for purchasing the Atlanta Flames and moving them to Calgary, so he brought a certain amount of credibility to the CFL. Immediately, he decided to upgrade the talent of the Alouettes. He signed NFL veterans James Scott, Billy “White Shoes” Johnson, and the up and coming runningback David Overstreet. His biggest signing was yet to come. Keep in mind, they were two years removed from an Eastern Conference championship and a Grey Cup appearance. Meanwhile in Los Angeles, things were also changing. The Rams had relied on quarterback Pat Haden for years, achieving regular season success, but running into the Doomsday Defense of the Dallas Cowboys in the playoffs. That all changed in 1979 when Haden got hurt and Vince Ferragamo took over as quarterback of the Rams. He threw a TD pass to Billy Wady late in the NFC Divisional Game against Dallas, shocking the Cowboys, and setting up a showdown against the Tampa Bay Buccaneers for a chance to play Pittsburgh in the Super Bowl. They won that game too, as Frank Corral kicked three field goals, and the Rams won 9-0. Ferragamo would become the first player in history to start a Super Bowl in the same season he had his first professional start. They would get beaten by Terry Bradshaw and the Steelers in the Super Bowl, but Ferragamo had the team leading after three quarters. Things looked promising for the Rams. Haden, coming off injury, started the season at quarterback, but again was injured, opening the door for Ferragamo again. He passed for 30 touchdowns, second most in the NFL, and a team record, and was the team's most valuable player. However, the Rams lost the NFC Wildcard game to Dallas. Ferragamo’s contract was up, and he was seeking a raise from the $47,500 he made in 1980. The Rams offered him $250,000, but along came Nelson Skalbania and the Montreal Alouettes, with an offer of $400,000 over two years, which was rich even by the NFL standards of the time. It was the right offer at the right time. Vince Ferragamao was coming to Canada. The 1981 season was not kind to the quarterback from Nebraska. He had difficulty adjusting to the CFL game. In his opener against the B.C. Lions in Vancouver he went 13 of 30 in a 48-8 loss. In their second game, he engineered a last-minute drive to help Montreal beat Toronto 23-22 in their home opener, then passed for 353 yards in a 33-31 loss to Ottawa in their third game. He would go on to play 13 games, going 175 of 342 for 2,182 yards, seven touchdowns, and 25 interceptions. By the end of the season, he had been replaced by veteran CFL quarterback Ken Johnson, as the Alouettes plummeted to 3-13. Incredibly, they finished third in the CFL East and still made the playoffs, losing to Ottawa in the East semi-final. (The clip below features Ferragamo doing battle against the Warren Moon-led Edmonton Eskimos). Since Ferragamo signed two, one-year contracts, he left Montreal after the end of the 1980 season, returning to the Rams. The great CFL experiment was over. Vince Ferragamo never achieved the same success he had before he left, although there were flashes, finally retiring after the 1986 season. His one-year stint in Canada was a strange chapter in the history of the CFL. 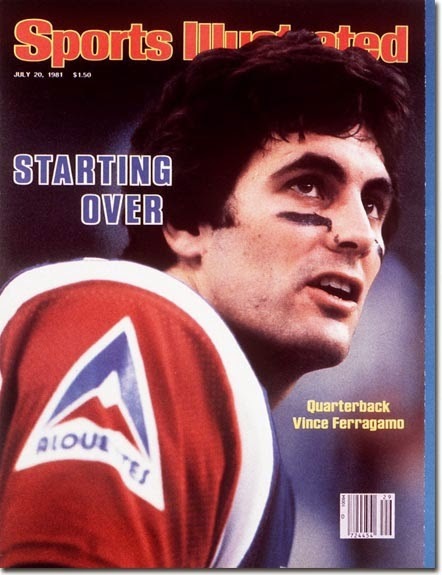 Unlike Warren Moon, who came to the CFL as a relative unknown, or Doug Flutie, who had enjoyed incredible success in college, but never got the same opportunity during his first stint in the NFL, Vince Ferragamo was a bonified NFL star who came north for more money. Sadly, in some reports he blamed his lack of success on the CFL being a “minor league”. That’s unfortunate, because it’s not the game’s fault he could not adjust to different rules – especially when the likes of Moon and Flutie could (and Jeff Garcia and Joe Theismann and Joe Kapp for that matter). The inflated contract he signed also aided in the demise of the Alouettes who would have money troubles from then on and eventually fold – twice. It also led to an escalation in salaries that almost led to the demise of the entire league. Still, looking back, it is still pretty remarkable a player of that calibre jumped ship and came north. He was one year removed from being the quarterback of the Super Bowl runner-up. Can you imagine Colin Kaepernick jumping to the CFL today?